Itâ€™s a little surprising that with my vast amounts of reading in the teen genre, the name James Dasher has never come by my bookshelf particularly since he has a series of dystopian novels. The trilogy, currently on book two, starts with â€œThe Maze Runner,â€ which takes place in a mysterious place simply called the Glade. Thomas wakes up remembering only his name, to find himself in this mysterious place with a number of other young men. 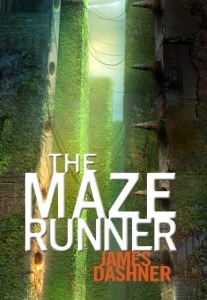 The situation is dire: the Glade is surrounded by a maze that the boys havenâ€™t been able to solve in two years. Every 30 days, a new boy arrives but the routine is thrown off when the day after Thomasâ€™ arrival, a girl, the first ever to be delivered, appears in the elevator with a note. It appears the note plays a pretty significant part in the rest of the story and not being familiar with the books, Iâ€™m not sure what the note says but this I know for certain: donâ€™t be expecting some blood bath over who gets to knock up the girl. The books are rated for grades 6 to 10 so I expect the sexuality will be minimal if not all together non-existent. Apparently Random House has been shopping around the rights to the Maze Runner trilogy since the first book was published in late 2009 before it landed at Fox where itâ€™s being prepped as a potential major release to undoubtedly, turn into a franchise. News today, via The Playlist, is that The Maze Runner has found a director and itâ€™s none other than Catherine Hardwicke. This doesnâ€™t come as too much of a surprise as Hardwicke did extremely well with the set-up of the immensely popular Twilight franchise and she has made a name for herself as a director who has a great handle on teen material. Now, Hardwicke was already attached to another potential franchise, this one an adaptation of James Pattersonâ€™s Maximum Ride and last I heard, she was still on board with the production so who knows when weâ€™ll see either of these films come to fruition but weâ€™ll keep you posted as news develop. More details on Dasherâ€™s book available on the publisherâ€™s website. James Dashner's thrilling novel, THE MAZE RUNNER gets star treatment in Brighton Linge's dazzling video, a finalist in the Kirkus 2009 Book Video Awards, sponsored by Random House Children's Books and co-hosted by BN.com. Linge is a fourth-year cinematography major at University of North Carolina School of the Arts.